Do our goals create our self-identity? Or does our self-identity create our goals? And are we ever too old to reach for new dreams? Wow, that’s pretty heavy stuff for this blog, which usually focuses on profound issues such as what flavor Gu is best (they’re all disgusting, if you ask me). But I recently I’ve given some thought to things like goals and self-identity. My epiphany was in the context of running, but these thoughts are applicable to other areas as well. However, there’s no need to go all crazy, big-issue, meaning-of-life here. Let’s just stick to running, shall we? You can extrapolate for yourself if you must. See, I’ve always thought of myself as a slow runner. But I decided to conduct an experiment. I wanted to see if I could run faster simply by deciding to run faster. No speed-work, no complicated training program, no detailed race plans. If I just stopped telling myself I couldn’t do it, what would happen? It began when I ran with my brother and my niece a few months ago. It was the first time I’d seen them in a while, so I thought a run together would be fun. But they, like 90 percent of the world’s runners, are faster than me. As we ran along, I kept looking down at my Garmin, slightly panicked, thinking “I can’t keep this up!” But I didn’t want to fall behind, partly because I enjoyed chatting with them, but also because I was in an unfamiliar area and didn’t want to get lost. So I kept up. And in the end, it turned out I was fine. In fact, when we were done, I felt more energized than usual. Hmm, I ran faster and felt better? Interesting. 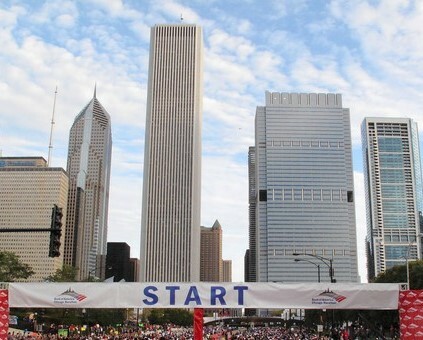 Part Two came a few months later when I did the Chicago Rock and Roll Half Marathon. Somehow, I ended up in a fast corral, with the speedy people. As the race started and everyone took off, I found myself going much faster than usual. I forced myself to slow down, telling myself I couldn’t maintain such speed. Yet, when I crossed the finish line, I felt great and had a nice new Personal Record, too. Again, interesting. I wanted to see if the Chicago RnR Half Marathon was a fluke, so I did the Oak Brook Half Marathon a few weeks later. I shaved another 4 minutes off my time. 2:03:57. Hmm. 2:03 is awfully close to 2:00, which is almost the same as 1:59. Could I possibly? No! Me? Under two hours for a half? Never! Well, maybe. I decided to try. Should I have planned ahead and lost 10 pounds and done months of speed-work in preparation? Well, yes, but I really just wanted to see if I could run faster by simply deciding to run faster. Sure enough, I did. Last weekend, I ran the Lake Zurich Half Marathon in 1:57:31. And I felt great at the end. Granted, I had perfect running weather, which helped. But still, good weather or no, that’s a fast time for a slow runner. So it’s a little crazy, isn’t it? Since I thought of myself as a slow runner, I could never have an under-two-hour half as a goal, and yet I just ran one. Granted, I’m still slower than a lot of runners out there. But I managed to be in the top 20 women at Lake Zurich, so if I’m still slow, a lot of people are even slower. I guess this all means I need to stop saying “Oh, I could never do that.” I thought I could never run a marathon, and I did. Then I thought I could never run a sub-two-hour half, and I did. So, assuming I have another marathon or two in my legs, is it ridiculous to have a sub-four-hour marathon as my goal? Well, if I get down to my race weight and start doing some actual training, including that much-detested but necessary evil, speed-work, I think it’s possible. And if I’m going to have a sub four-hour marathon as my goal, I may as well go ahead and shoot for 3:55, the Boston-qualifying time for my age group. BQ? Ridiculous, right? To start eyeing a BQ at my age, well, that’s crazy talk. There’s a voice in my head that says I’m too old, that new goals and big dreams belong to younger people, that I should just stop and be content with where I am. But then there’s another voice in my head that says “Why not?” I know some of you will say that if I hear voices in my head, I really should go to a therapist. You’re probably right. But first, I plan to chase Boston. If I get injured, I get injured. If I can’t do it, I can’t do it. But I might as well try. And since slow runners don’t try to qualify for Boston, I guess it’s time to stop thinking of myself as one. As of right now, I’m just a runner. « Summer 2011: Am I Smarter Than Your Average Bear? I’m having the same epiphany right now. I just want to be fast. Good luck with the BQ! Thanks Laura, and good luck to you too. Thanks Margaret. We’ll see, maybe I’m crazy after all. I love this, Sue. Congrats on an epiphany! Now just train smart and take care of yourself. Good luck! Thanks Crysta. Keep your fingers crossed for no injuries. I fully support this decision. The big turning point for me was learning how it felt to be comfortably uncomfortably while running. And then to speed a little up from that. Comfortably uncomfortable….and then speed up. I like it. Thanks Jeff. This makes me so happy!!! At the rate you are PR-ing, Boston is well within your reach. How amazing would it be for you and I to start at Hopkinton together in 2013? I’m looking forward to seeing you get faster and stronger. You’re so sweet to think we might be in corrals even remotely near each other – assuming I make it! But hey, you never know, right? Wow! What a goal. I have no doubt you’ll BQ. None. Zero. It’s already in stone. Thanks Ed. Although there is still part of me that thinks I’ve lost my mind. As long-time reader and mostly non-running friend, I have never bought your “didn’t think I could do it” arguments. And besides, since you regularly finish marathons and I’m still bumping along run/walking for the 5K, your thought process is somewhat annoying. I read a great book earlier this summer called The Power of Story, written by Jim Loehr who helps famous athletes focus their training by rewriting their stories. I may or may not have blogged about it on twokitties/small city. I think I did. Anyway, it was an awesome read and Loehr convinced me to push past my “I’m fat and I have a bad food” thinking to run again; maybe you’ll get something out of it too as you train for your BQ.